With luck (and a lot of work) I got to attend GAMA this year, the industry premier trade show for board games. This is not a gaming convention: This is a trade show where publishers show off upcoming games, and distributors make deals with game store owners. No one is playing games, they are talking component count, order volume, and MSRP. It’s an intimidating place full of strange terminology, but if you can brave the waters, it can be one of the better places to attempt to pitch a game. If you want to attend GAMA, the first thing you need to do is apply for a membership. Their membership page is here. Make sure you do this well in advance. GAMA is notorious for being difficult to communicate with. I applied only a month and a half in advance of the game show, it it took me upwards of 10 calls and emails to confirm membership. It is also important to know that this is a trade show, and not a convention: They will check credentials to make sure you are serious. If you don’t have a published game, having a website up with design articles (like this one!) will definitely lend some veracity to your application. As a game designer, you will likely be registering as a Communicating Member, which will run you $50. The convention itself is a separate signup. Be sure to chase this one as well (This is going to be a running theme. Pitching your game is a ton of stressful work, for not much payoff. Be prepared. ), because there is a separate person that handles registering for the con. The entrance pass is $125. However, there is apparently a deal for game designers out there: The Academy of Adventure Gaming Arts & Design. Signing up for this club ($50 membership) will get you a free pass to GAMA (saving you $125) and two free passes to Origins. Even if you are only going to GAMA, it is worth the signup to save $75. Alright, your membership got approved, you got a ticket to the trade show, your flights and hotels are booked, and you’re pumped up. Yeah! There’s still a lot to do. Here’s a list of things you should prepare in advance, before you even head out to Vegas (or Reno in 2018). Put your name and contact information in the box. Preferably on the box itself. In several places. How bad would you feel if you never heard back from the publisher because they didn’t know whose game it was? Keep your rules as short as possible. Simpler games are always better (Unless you are pitching to CGE) and a one page rule sheet is much less intimidating than a five page one. Your goal is to get it to the table, and short rulebooks and playtimes will help do that. As a corollary to the above, consider making a youtube video explaining how to play. Players would much rather watch a 5 minute video that read a rulebook. Put the address of the video in the box. Don’t stress art. Having a better looking game will get you more eyes, but don’t spend any money on it. 99.9% of the time they will toss any art you have and do their own, so all the money you paid for it will be wasted. And you won’t be making “Throw away money on art” money, trust me. YOUR name. And email. And phone number. Artwork is optional. I ended up paying a designer $100 to design my sell sheet for me. I don’t know if that helped me out or not. This is one of those pieces of conflicting information I got: Some people liked rich looking sell-sheets, and some said they didn’t care, don’t spend any money on it, and preferred white space so they could take notes in the margins. In my experience, no one ever took notes on the sell sheet, so take it for what you will. This is what I used as the basis for mine, and you can see the completed version here. Business Cards: This is something I did not do, and regret. There were many times where I was asked for a business card, and had nothing to hand out. I gave out copies of my sell sheet instead, which worked, but was not ideal. Research: There’s going to be a LOT of booths. I count 136 this year. Not every publisher is going to be interested in your game (You wouldn’t try to sell a minis game to an educational toy publisher, right?) so doing your research on the companies in advance will give you ideas of who to talk to. I have to give major props to Jeremy of Board Game Builders for pointing out some vendors on the floor for me to pitch to. I could have saved myself a lot of stress if I had known to look into publishers in advance. Cough Drops and Water: Near the end of a pitch, my throat closed up, and I coughed so hard my eyes started watering. Pitching your game is a feat of endurance: I spent 5 hours on the show floor, walking around, shmoozing, setting up appointments, and running demos, and I spent most of it talking. Brian of Overworld Games was a life saver, and handed me a handful of cough drops that got me through the last two hours. Never something I would have expected to need, but something I would never do without next time. Alright. You made it to the show, your prototype is ready, and you are ready to pitch. But where do you go? GAMA has a publisher date night. This is the first place you will have a chance to pitch your game, and you automatically have an interested audience: The publishers cruising around are specifically looking for games. My game was less visually impressive than others, and I definitely saw people skip over me because of it. But it is a balancing act: Making your game look better has costs you won’t recoup. In addition, high component count games look awesome on the table, but publishers may decide that it isn’t worth the production cost when they do the math. This ended up leading to one appointment for a demo. Try to show up early so you can grab a better spot. The best place to pitch is the trade show floor. Ask publishers if they are accepting game submissions. Some will be overloaded, some will not be looking, but some will. Be prepared to give your pitch then and there, but don’t be surprised if you need to set up an appointment. I spoke with about 9 publishers on the show floor. 3 of them liked my pitch enough to let me run a demo. One of them was available immediately, and the other two set up appointments for later. Wander. Although the convention is primarily for store owners and publishers, people wouldn’t be in the industry if they weren’t gamers. Check the local cafes and seating areas. I saw more than a few games being played. I jumped in on one of them, and it turned out that one of the players was a publisher. The random game turned into a pitch, and eventually a demo. Shmoozing, as well, is a great way to meet people, if you are the extroverted type. The pitch is definitely the most important part of selling your game. The pitch should let them know exactly what kind of game it is, how many players it plays and for how long, and what the general theme is. My one-liner was “A deep, fantasy auction game you can play in 30 minutes.” Some people will stop you there, and you should thank those people. Just because they don’t want to hear your pitch doesn’t necessarily mean your pitch is bad: It means that that game isn’t what they are looking for. Some publishers don’t want auction games, or fantasy games, or short games. Remember that this is a business: They don’t want to spend time on things that they have no intention of picking up, and they are sharing that courtesy with you. If they are interested in hearing more, you get to give your elevator pitch. This should be about thirty seconds, and give a decent indication of the flavor of your game, as well as what makes it unique. I basically read off the paragraph on my sell sheet. You don’t need to teach them the entire game, just give them a basic description of the most unique mechanics. “When an evil card comes up, you have two options: Either pay money to make it someone else’s problem, or deal with it yourself and gain all the money other people payed.” I didn’t bother explaining favors or bargaining unless they wanted to hear more, because while it makes the game more interesting, it doesn’t alter the core mechanic enough that it bears explanation. Alright, they liked your one-liner and elevator pitch. They took a look at your sell sheet, and agreed to a demo. Congrats! That’s most of the hard part out of the way. Now you just have to run your game. Try to set up a shorter game, if possible. 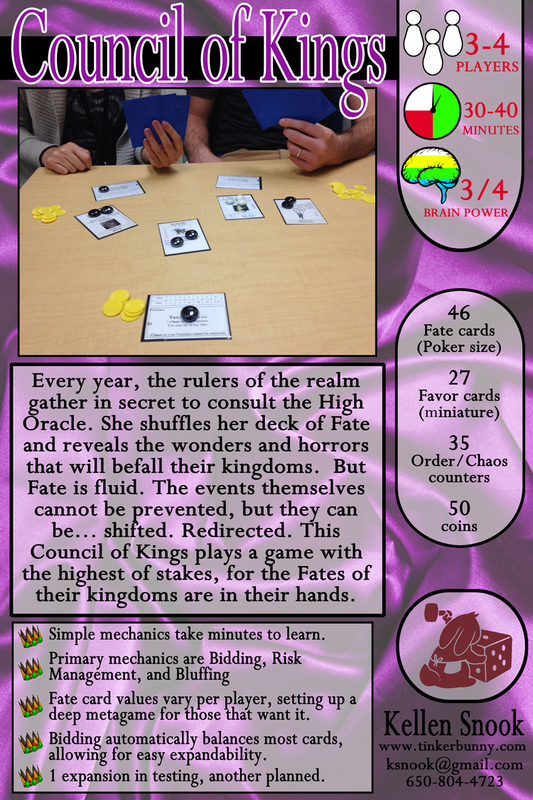 Council of Kings is 30-45 minutes, but I made a special 15 minute demo game for the con. Sometimes you are only going to have half an hour, and there’s no way you are going to be able to play your two hour epic in that. It isn’t always possible to set up in advance, but if you have an appointment, try to set up the playtest before the players get there, so you don’t have to waste their time. Focus on the most interesting choices: Is it in the early game, where you choose your route? The midgame, where you have to finish on your engine? Or the end game, where you have to deconstruct it for maximum points? Do NOT be afraid to stack the deck. This isn’t a game. You aren’t playing to win. You’re trying to present the best possible version to the publisher. I have 3 types of favors (ones that can be played before buying cards, ones that can be played during the action phase, and bargains) so I gave each player one of each. I didn’t stack the Fate deck, and regretted it: I ended up with a super awkward arrangement during one of my playtests where I was 1 counter shy of running out of counters. Don’t read into things. In the playtests I did, no one ever had any small talk, and most of the players had a poker face that could get them into the World Series of Poker. That stony silence isn’t necessarily disapproval, it is expectation management. If they look interested just to be polite and you read into it too much, you are setting yourself up for a crushing disappointment later. Approach the playtest for what it is: A business deal, where the game is the product. Don’t be surprised if it ends early. They are looking to get a picture of the game, not play a full version of it. If they like the mechanics, they will ask for a prototype. Sometimes the people playing aren’t the decision makers, and they need to go back to confer. Take a business card, and follow up. After Monday’s prototype night and Wednesday/Thursday’s trade show floor, GAMA is over. If a publisher liked your prototype, they may ask for a copy at the con, or they may ask you to mail it to them later. Take all those business cards you collected, and keep notes on them. Who was interested, who wanted to know more, and who wanted a prototype? Follow up, but give them time: GAMA is busy for everyone, and while it may be a big deal to you that a publisher was looking at your game, you were one of the dozens of meetings they had to conduct. The advice I heard from the show floor is no more than one email a month. If there are any questions, shoot me an email, and I will add the answers to this post. Great post, thanks for sharing! The pitching world is a whole other ballgame; I really appreciate you taking the time to demystify it a little for the rest of us newer designers. That was a fantastic summary for dealing with the unique beast that is GAMA, while still having a ton of info that is valuable for almost any other con as well, especially breaking down the different types of pitches you will do based on the situation, as well as the concept of “stacking your deck” to set up your game demo in the best light. Thanks for sharing the links, tips, and detailed considerations for this show. We had a game of ours floating around the floor, but it will definitely be more rewarding and fun to be there in person next year!